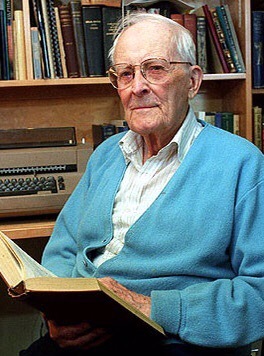 NOTE: Today would be the 107th birthday of Hugh Nibley. In his honor, I’m posting this little essay I wrote about Zion. Belief that Christ’s second coming was immanent accompanied the revivalism and religious zeal of the Second Great Awakening. During the nineteenth century, as one historian put it, “millennialism was at times almost synonymous with revivalism or evangelicalism.” However, the nineteenth century also saw a new breed of millennialism emerge and triumph within America: “post-millennialism.” As the name suggests, whereas “pre-millennialists assumed that Christ would arrive on earth to usher in the millennium and then return thereafter for the final judgment, post-millennialists believed Christ would only come after the millennium. Post-millennialists tended to read scripture allegorically, seeing prophesies about the end times symbolically rather than literally. Prophecies, for example, of the lamb lying down with the lion represented not a literal event, but a general move the world would take toward peace and justice. Whereas premillennialists believed the millennium could only be brought about through Christ, postmillennialsts believed human progress would lead to a future of peace and light. Premillennialists had modest goals to bring as many as they could out of darkness into Christianity—after all, only a minority of humans were destined to be saved at the last days. Postmillennialsits, on the other hand, believed that missionary work and social reforms would usher in the prophesied thousand years of peace. Postmillennialists believed, in essence, that if we build the city of God, he will come. Due to their more optimistic view of human nature, some postmillennialists labled themselves “optimillennialists” in contrast to their more cynical “pessimillennialist” cohorts. Nevertheless, a distinctive feature of Mormon millennialism mitigated against the despair over the earth’s inevitable passing: the concept of Zion. The “pivotal preliminary event in Mormon eschatology,” as Grant Underwood has described it, Zion was to be the final gathering of the Lord’s elect in a most literal sense. It was “a means of escape [for the righteous] from much of the anticipated tribulation of the last days.” Zion was to be an actual at-one-ment of hearts, minds, and property that would secure God’s elect if they persevered faithfully to the end. “If ye are not one, ye are not mine,” the Lord says (D&C 38:27). And this at-one-ment not only required shared commitment and faith, but a radical redistribution of wealth. “For if you are not equal in earthly things ye cannot be equal in obtaining heavenly things” (D&C 78:5-6). The word “restoration” as used by early church leaders did not so much denote the restoration of priesthood keys, rather it denoted a restoration of the earth to a primordial Eden and the restoration of humanity as a family with its God. Since then, two competing visions of the future have animated Mormon thought: Armageddon and Zion. These two eschatological visions of the future—the destruction of the earth and the gathering of a righteous people—continue to this day; however, the one is still interpreted literally, the other spiritually. The Saints continue to anticipate the literal calamities of the last days with Sunday School lessons regularly teaching about the signs of the times and church members interpreting global political, social, and natural events through a lens of apocalypticism. However, the focus of Zion has shifted from the concept of a literal gathering to a spiritual gathering of converted souls—from a society with all things in common to a society of more-or-less common beliefs. The idea of Zion is still regarded as an at-one-ment of a people with their God, but it is a shadow of its former self. Today, the gulf between the haves and the have nots has widened to unprecedented proportions and we hear mean-spirited political rhetoric decrying the poor who are evidently taking no responsibility for their livelihoods and who think they are entitled to government handouts. But Hugh saw things differently. Hugh argued that “the cornerstone of virtue, ‘He that is idle shall not eat the bread . . . of the laborer’ (D&C 42:42), [which is] hailed as the franchise of unbridled capitalism, is rather a rebuke to that system which has allowed idlers to live in luxury and laborers in want throughout the whole course of history. The whole emphasis in the holy writ,” Hugh continued, “is not on whether one works or not, but what one works for: ‘The laborer in Zion shall labor for Zion; for if they labor for money they shall perish’” (2 Nephi 26:31). Hugh once remarked about a time when he was traveling with a General Authority who told him that “the important thing is to observe the law of consecration ‘spiritually.’” Hugh was flabbergasted. His response left the GA stunned: “Yes indeed, say I, and the law of tithing also—how much better to observe it spiritually than in a gross, material way” (280). President Kimball linked the second coming to both our missionary work and a need for consecrated hearts. Unfortunately we live in a world that largely rejects the values of Zion. Babylon has not and never will comprehend Zion. The Lord revealed our times to the prophet Mormon, who recorded this statement in a closing chapter of the Book of Mormon: ‘Behold, I speak unto you as if ye were present, and yet ye are not. But … Jesus Christ hath shown you unto me, and I know your doing. For behold, ye do love money, and your substance, and your fine apparel, and the adorning of your churches, more than ye love the poor and the needy, the sick and the afflicted.’ (Morm. 8:35, 37.) This state of affairs stands in marked contrast to the Zion the Lord seeks to establish through his covenant people. Zion can be built up only among those who are the pure in heart, not a people torn by covetousness or greed, but a pure and selfless people. Not a people who are pure in appearance, rather a people who are pure in heart. Zion is to be in the world and not of the world, not dulled by a sense of carnal security, nor paralyzed by materialism. No, Zion is not things of the lower, but of the higher order, things that exalt the mind and sanctify the heart. Zion is ‘every man seeking the interest of his neighbor, and doing all things with an eye single to the glory of God.’ (D&C 82:19.) As I understand these matters, Zion can be established only by those who are pure in heart, and who labor for Zion, for “the laborer in Zion shall labor for Zion; for if they labor for money they shall perish.” (2 Ne. 26:31.)…. Let us unite and pray with all the energy of heart, that we may be sealed by this bond of charity; that we may build up this latter-day Zion, that the kingdom of God may go forth, so that the kingdom of heaven may come. While the institutional church seems farther away from the goal of consecrated living, I have talked with numerous Mormons who have found Nibley’s words personally and spiritually satisfying. These people have given up high-powered jobs to pursue lives of simplicity and consecration. Even though we cannot fully achieve Zion individually—it takes a community of believers—we can change our individual lives and refocus and retool them to concentrate on the things that matter most. I believe Zion does animate the hearts of Latter-day Saints, and I have witnessed the amazing lives consecration has produced. Now, I think I’ll go make some spiritual investments in the spiritual stock market so I can live the law of consecration spiritually. My real money I’ll use to build a big house up on a hill in Draper, but all the while I’ll be thinking about the pour souls that only have one spiritual ski boat. The spiritual DJIA never goes down, fortunately, so I can keep giving away every spiritual dollar I make. I think I’ll just invest spiritually funds into the spiritual stock market so I can share my spiritual income, since that’s all that really matters, right? To give spiritual comfort to the poor. I am living the Law of Consecration spiritually! Yay me!